One Year No Beer: Are You Ready To Take The No Beer Challenge? One Year No Beer founder, is my guest today, on the Steve Jobs inspired Join Up Dots free podcast interview. He is a man who a few years ago was living a life like so many people across the world. Working hard. Playing hard. And spending a lot of his money in the bars on a Friday night. But things have changed dramatically for him, not just in a health sense, but also in a professional and monetary sense too. He gave up drinking in the face of incredible peer pressure, thinking he would lose his edge as one of the Top brokers in the world but soon realized it was quite the opposite. 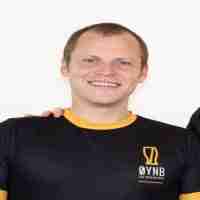 Spurred by this life changing experience he and his business partner, Andy Ramage, another broker, have created the OYNB movement. Which for us all stands for One Year No Beer, where he inspires the world to look for a healthy way of living by speaking about improving all aspects of your life by changing your relationship with alcohol. And now after 2 years alcohol-free he now drinks in total control. He is passionate about helping people change their relationship with alcohol using their 30, 90 & 365 day challenges. But what interests me as much as his personal journey, as this man is someone who quite obviously has the entrepreneurial spirit running through him, even though he has for the main part worked for companies throughout the United Kingdom. For example for three years he was the owner of Briaf Ltd, a Sales Outsourcing Agency, offering Telesales, Field Sales and Sales strategy for SME’s in Edinburgh, before joining PVM Oil Associates as an employee again. What made this occur? Is this business still around or laying in the dust of failed enterprises? So many questions to be asked. But more importantly with his book One Year No Beer flying off the shelves at Amazon , members joining up for the challenge across the world, and bar owners puling their hair out for loss of profit, does he feel that this is the thing that he has been waiting for in his life? And how do you monetize a challenge which most people could just do on their own? How difficult it is to get people to embrace a challenge unless they have skin in the game. Freebies take a business nowhere, but memberships are the gold. How he came to the realisation that he could start a mission that would then take on a life of its own, even with all the challenges that this would take. Why tackling sobriety is so much more than just getting away from the booze for a bit. It’s quite simply life changing in so many ways. Why everybody should look at what is in alcohol before you start throwing it down your neck…one step away from petrol doesn’t sound a good idea to me! !